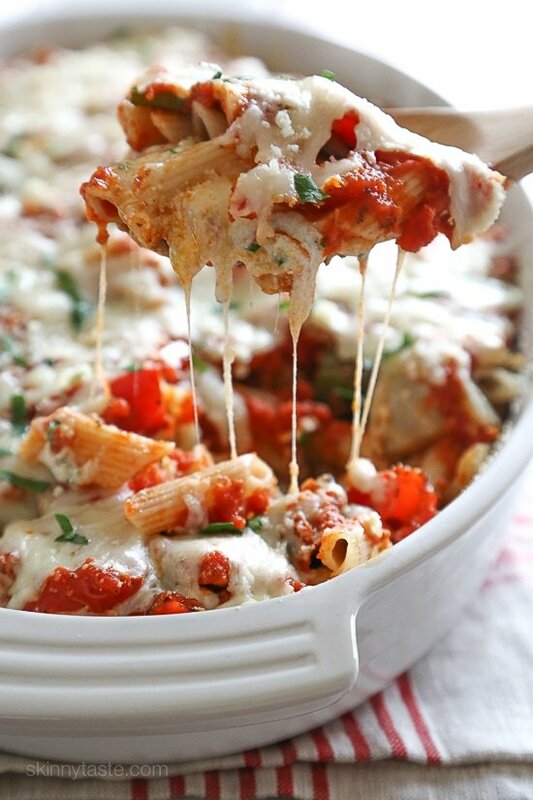 Penne baked with cheese, sauce and loaded with healthy vegetables in every bite. Roasted zucchini, red bell peppers, asparagus, red onion and fennel are tossed with balsamic and herbs then roasted for the best tasting meatless baked pasta dish EVER! As much as I love my low-carb days of eating spaghetti squash and spiralized veggies, let’s face it, nothing beats real pasta once in a while. What I love about the Weight Watchers diet is that no foods are off limit. Pasta, pizza, cheese, you can have them with some simple tweaks to your favorite dishes, portion control and balancing out your day. In this dish for example, the pasta is loaded with so many vegetables to keep portions large and satisfying for a balanced dish. My aunt has an auto immune disease and can’t tolerate gluten, so I made this with Delallo’s Gluten-Free Whole Grain Penne. I first discovered their gluten-free pasta when I got some samples and shared with my girlfriend who has Celiac. She loved it so much she asked me to get her more and I’ve been a huge fan ever since. Wheat pasta can also be used, whatever your family enjoys. 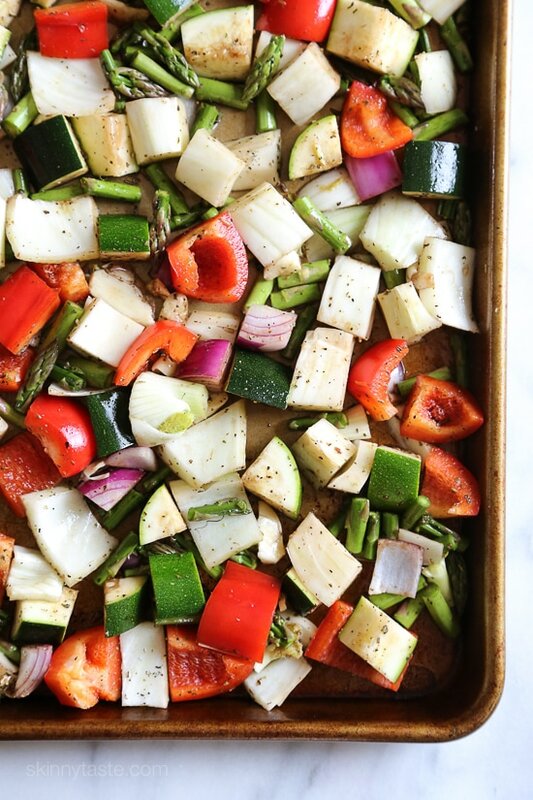 Spray a large baking sheet with oil, toss the peppers, zucchini, fennel, asparagus, red onion and garlic with balsamic, olive oil, 1/2 teaspoon salt, black pepper, and dried herbs. Roast until tender on the lower rack of the oven, about 15 to 20 minutes stirring halfway, until slightly browned tender. Meanwhile, bring a large pot of salted water to a boil and cook the pasta according to package directions for al dente, (undercooking slightly as it will continue cooking in the oven), drain. In a medium bowl, combine the ricotta, parsley, 6 tablespoons of the Pecorino Romano cheese and half of the mozzarella cheese. Spray a deep 13×9-inch baking dish with olive oil spray. Put half of the cooked roasted vegetables into the prepared baking dish, then half of the pasta and top with 1 cup of the sauce. Spoon the ricotta mixture on top of the sauce in an even layer. Cover with the remaining pasta, then vegetables, then the remaining sauce. Finish with the remaining mozzarella and 2 tbsp Pecorino Romano cheese. Cover with foil and bake in the center of the oven for 25 minutes, or until the mozzarella is melted. Made in partnership with Delallo Foods. A brand I love and use in my home. So good!!! Love roasted vegetables and this was just next level! Swapped out the asparagus and fennel for carrots and parsnips – just delicious!!!! This is my first recipe from this website, and it was delicious. I love regular baked cheesy penne but nevermind thought to combine it with roasted vegetables. What a winner!! 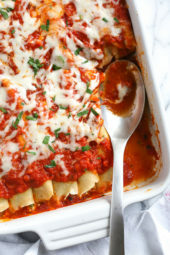 I made a veggie version and one with turkey (browned and simmered with marinara sauce) – both were great.I have women picky eaters in the family so had to swap out some vegetables. I think just about anything “roastable” would be fantastic here. I did broccoli, yellow squash, zucchini, and baby portabellas. It was a huge hit. Thank you!! Made it as written and it was perfect! Used Trader Joe’s marinara with Barolo wine and it was so complimentary to the balsamic in the roast veggies. My husband even said it was good and went back for seconds which is huge because if a dish doesn’t have meat in it he typically hates it! Another winner from Skinnytaste! Thank you Gina! Made this for dinner last night! So good and easy ! Prepared earlier in the day then popped in the oven. Subbed asparagus for tomatoes and more zucchini! Will definitely make again! Can the balsamic be substituted for something else? Made this last night and everyone enjoyed it. The roasted veggies added such a nice flavor. Oh my goodness…excellent..used less cheese..but still cheesy and creamy..wanted to try before making for company..will be a favorite..will try adding some basil next time..didn’t make my own maranara..but still excellent..I didn’t prep and roast the veggies day before..also might add mushrooms.. This dish is absolutely amazing. I omitted the fennel and added an extra zucchini. 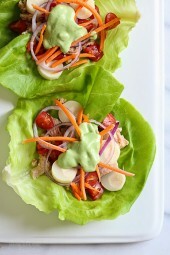 So easy to make, flavorful and absolutely delicious. The best part is that you don’t even miss the meat with this! Absolutely Delicious! The veggies roasted with the balsamic vinegar are amazing and you don’t miss the meat. I followed the recipe exactly and it came out perfect. My picky 11 year old had seconds. I’ll definitely will be making this again! Also made it for dinner tonight. Simply amazing. Great flavor. Shared it with daughter and her family. Will make this again!! This was absolutely delicious! Hubby loved it; said it was in the top 5! I made this for dinner tonight and I will definitely be making this again. The whole family loved it! Truly delicious! Just make it tonight and the kids asked for seconds. It was absolutely delicious. I made this tonight with a few changes. 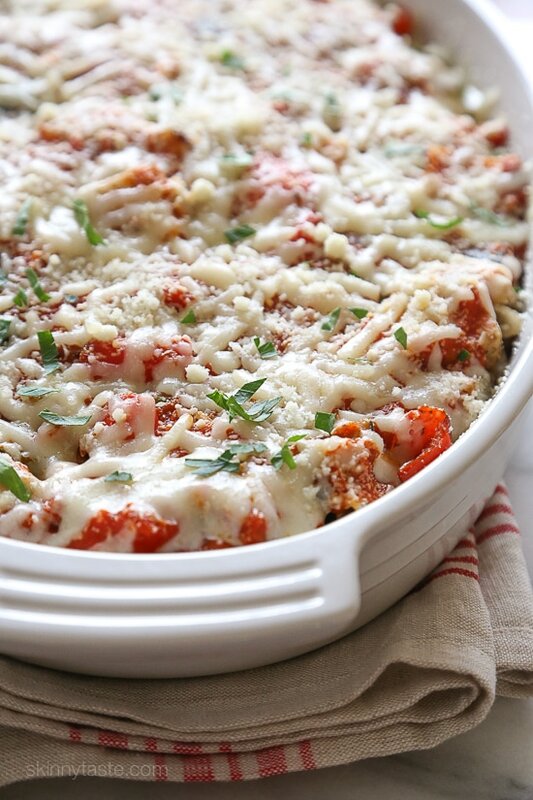 I left out the ricotta because I don’t like the texture and it was still plenty cheesy for us. I also substituted broccoli and eggplant for the asparagus and fennel because that’s what I had on hand. It will be going in our rotation. This was amazing! Thank you! This was so sooo good. I followed the recipe exactly as written. We love this one! It’s so flavorful and quite easy to put together, although with all the vegetable prep I typically save it for a weekend meal. I plan on making this for some vegetarian friends soon. This was delicious! Will definitely make again! This was supposed to be five stars. This dish was terrific! I was very skeptical that these low calorie and “skinnified” dishes could taste this good, but this was awesome! This was very good! I think mushrooms would be a GREAT addition (if you like them!) 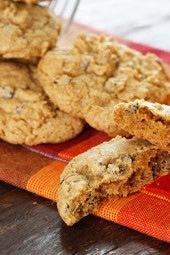 Thanks for another wonderful recipe Gina!!! It looks delicious! Please could some one tell me the weight of 1 and 1/2 cups ? Hi Gina! Could cottage cheese be substituted for the ricotta? Thanks! This was absolutely delicious! Seriously! I wanted a little more protein for this meal, so I added some lean Italian turkey sausage. It did increase the calories, but not so much that it wasn’t worth it. The vegetable blend you suggested is absolutely to die for! It adds so much flavor.!! I just had leftovers for lunch, and I think it’s possibly even better then next day! Thanks for such a great recipe. I like this recipe will make again. But I definitely need to make some modifications. I would use MORE veggies, and more marinara., it just wasn’t saucy enough for us. Less noddles, and maybe a different type, for my personal preference penne is only oK. Maybe Cavatapi or Bowties. The cheese mix was just right, I really felt like this too good to be just 359 calories a serving and vegetarian. Pretty yummy. Just made this and it is yummy comfort food! I didn’t feel like using fennel bulb in the veggie mix but used some ground fennel in the seasoning mix. It turned out very good and will make it again! Think I could use broccoli, carrots and zucchini for the veggies? This looks so good but I’m not an onion or fennel person. Hubby (& I) made this tonight! Minus the fennel and used parmigiana regiano instead of the other because hubby grabbed the wrong thing – still works. SO GOOD! Hubby is usually against vegetarian dishes but was willing to make this, and he is full and happy lol. Me too! My only issue is that your Smart Point calculations are off. It comes up as 10 points for the info you provided (but you didn’t provide saturated fats, which would become 11 points if sat fat is 4g.). Superb recipe we will be using again! Thank you! The SmartPoints® calculator isn’t meant for recipes and will often give you the wrong points (usually higher) because it’s counting the fruits and vegetables. So if you see a recipe with a SmartPoints® value that’s different from what the calculator tells you, that is why. We love your recipes! My sisters and I do a freezer meal cooking session about every 3 months, and most of the recipes we use are yours! This time around we are going to include this one, your Salisburry Steak meatballs, your chicken and bean enchiladas , and your turkey taco chili. Quick question for you–or anyone else who has input…Would you prepare as directed, baking the veggies for the full time (15-20 minutes)? Or should we bake for less time so they don’t turn mushy when frozen? Or maybe they won’t? I GREATLY appreciate all of the hard work you put into your blog! I love it! I made this last night, and my husband and i both LOVED it! What a great way to sneak in a couple vegetables to a pasta dish. I think roasted eggplant would be a great addition to this dish as well. The ricotta mixture was a little difficult to spread, but when it mixed a bit with the sauce layer below, it started to spread better. Maybe adding a little liquid to the ricotta mixture first would help. I have never commented on a website but I need to say you and your recipes are the only reason I have continued with the Weight Watchers program. Thank you for the work you do! The above recipe is one of my favorites and I am making it for friends tonight. This turned out better than I expected! I used the whole 8 oz container of ricotta and whole box of penne but it didn’t affect the taste…I just disnt want to waste the rest of the ricotta. I could eat the roasted veggies alone as a snack! This recipe definitely did NOT disappoint! How can I make this recipe more heart healthy? My cousin is coming to visit and he has heart problems – should I just use less cheese? Delish! Added some chili sauce at the end and it was amazing. I’m not a huge fan of fennel, and I also forgot to buy asparagus, so I added some eggplant instead and it was great. I found it a little hard to spread the ricotta/cheese mixture so i plopped it on in spaced out dollops which worked just fine. I also froze 2 leftover portions in individual cling wrap then foil – excited for a future meal! This was so delicious! Loved that I could eat pasta and keep it low-cal. Next time I’ll try it a little bit more sauce! Can I switch the cheese for goat cheese and can I take out the asparagus as I have some allergies, that need to be worked around? Made this for Sunday supper with my mother-in-law. We all loved it! Thanks for the delicious, healthy recipe. Will definitely make it again! Do you think I could prep this the night before and just do the oven part the next day? Would it hold up okay? Do you bake at 350 or 450 for 25 mins? We all loved this flavorful dish. Thanks, Gina! I’m going to try this, and have never had fennel except in a sausage.. is it really ‘licorice” tasting.. doesn’t sound very good (I didn’t like the fennel sausage). do you think it will make that much difference if not used?? amazing! I was nervous about the fennel too, but loved it all. My guests LOVED it, all asking for seconds. Thanks! Gina, you are incredible. I just want to say thank you. Every single recipe of yours that I have tried has become my favorite in whatever category it happens to be. I live in a state that is more obese than it is not and do my best to gently coax friends and loved ones into taking care of their bodies. That is hard to do when the food is bad. Your recipes are a Godsend. Thank you for taking the time and using your expertise to do what I lack the time or knowledge for, making healthy food delicious for people who don’t already like vegetables. Thank you Emily, that really means a lot to me! You know what? Scratch all of that. I see now that you are recommending a GF pasta for the dish. My bad! I really enjoyed this dish the flavor combo was wonderful.. I think I will try it using jumbo shells for an xmas buffet. I bet roasted eggplant and some wilted spinach mixed in before baking would be great too. Will be trying soon. This was excellent! I had to substitute a few of the veggies for those I had in my fridge, and it was still very tasty. Lots of leftovers to enjoy for a couple of days. Thank you for another great recipe. My husband and I just loved this really yummy dish! I knew it would be healthy with all the veggies, but didnt expect it to be as delicious as it is. It’s now on our regular recipe list! The only thing I did differently was to add a box of Portabella mushrooms cut into big chunks. Wow! Thanks Gina! I made this for dinner tonight. My husband was initially very skeptical of a meatless dish, but we all loved it! It’s so flavorful and satisfying. I added carrots instead of asparagus because my husband won’t eat asparagus. I was nervous about the fennel because I’ve never cooked with it before. We have enough left over for everyone to take it for lunch. I’ll definitely make it again. Great! Glad you tried it with the fennel! Do you bake this at 450 degrees or turn the oven down after roasting the veg? What pastas would you recommend using in this dish that are non-wheat based? Delallo makes a great GF pasta! My daughter doesn’t like Zucchini or asparagus…what other vegetables would you suggest? Carrots? Broccoli? Do you also cook the complete casserole once it’s all put together, at 450 or at a lower temp? Looking forward to trying this over the holidays! I have a sister-in-law who is vegetarian and we sometimes struggle to find things to make for them (that my meat-a-saurus husband will still find satisfying), but this seems like it will really fit the bill, and still be healthy and delicious. The addition of fennel is one I wouldn’t have thought of, but will add a nice dimension to the flavors. mmm this looks so good and comforting!